This post was sponsored by Vera Wang Fragrances as part of an Activation for Influence Central. I received complimentary products to facilitate my review. As always, all opinions are my own. Maintaining a beauty routine that works for you in the summer is likely pretty different than it is in the winter and finding something that works for you and makes you feel beautiful at the same time is important. 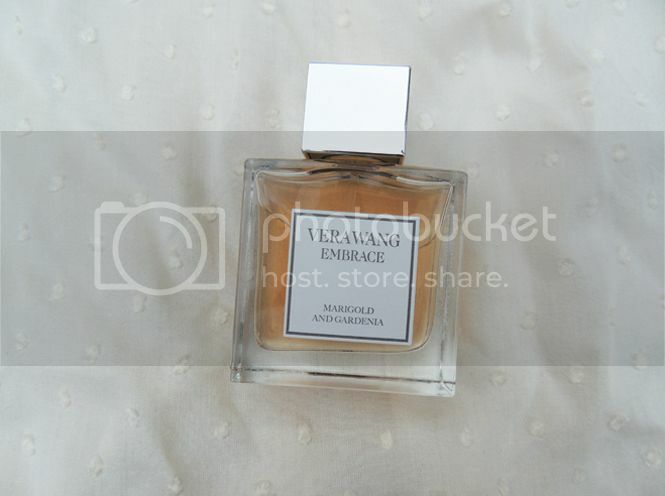 One of my favorite beauty products to use is the newest from the Vera Wang Embrace collection, Marigold and Gardenia. 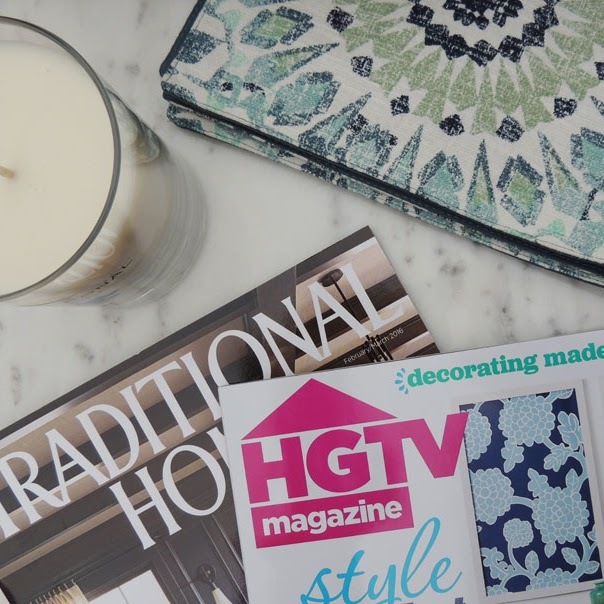 This scent is so gorgeous and it definitely is able to draw in inspiration to help celebrate moments in your life that should always be cherished! What better time to create memories to embrace than in the summer? Some of my best memories are from things that happen in the summer and it's by far the time that I feel most beautiful and confident, especially now that I'm using this Vera Wang fragrance. Taking time to celebrate yourself is one of the best things you can do to boost self confidence and esteem. It may sound silly, but after I get sun in the summer and my skin is golden and tan, I feel so much prettier! Now when I wear my Marigold and Gardenia perfume, I feel even better about myself. 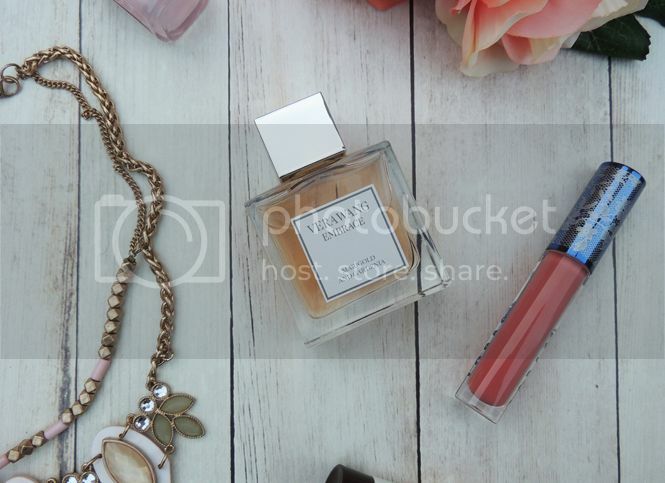 The perfume is the prettiest shade of peach and helps to boost your energy at the beginning of each day - you feel fresh, clean and embrace the true you! A simple BB primer/face tint for summer is my go-to makeup product; foundation can be heavy, and natural looks for summer are my favorite so I try and use minimal or neutral make up shades. I also love the Essie shade 'Fiji' (as I mentioned before) for summer more than anything - it's feminine, light and the perfect shade to make you feel prettier. I also love to use a bronzer and blush occasionally in the summer (especially bronzer) because I don't really get to wear it if my skin doesn't have that golden touch. 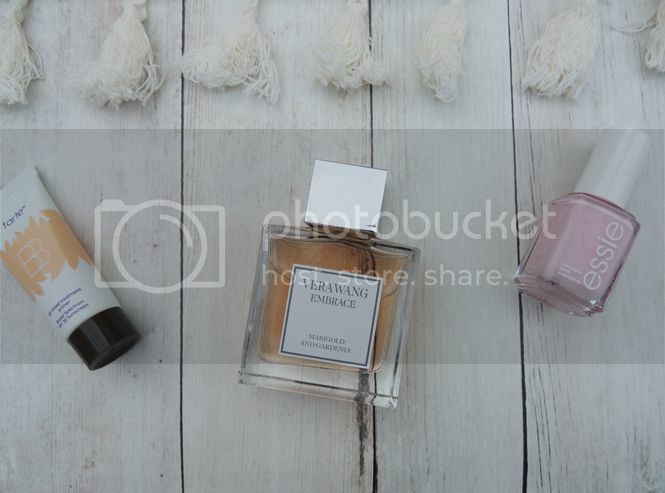 My newest favorite for my summer beauty routine is definitely the Marigold and Gardenia perfume, I'm so happy to have added it to my collection and I know it'll be a beauty staple for a long time! I love fun clothes in the summer and tassel detailed shirts are one of my favorites right now. 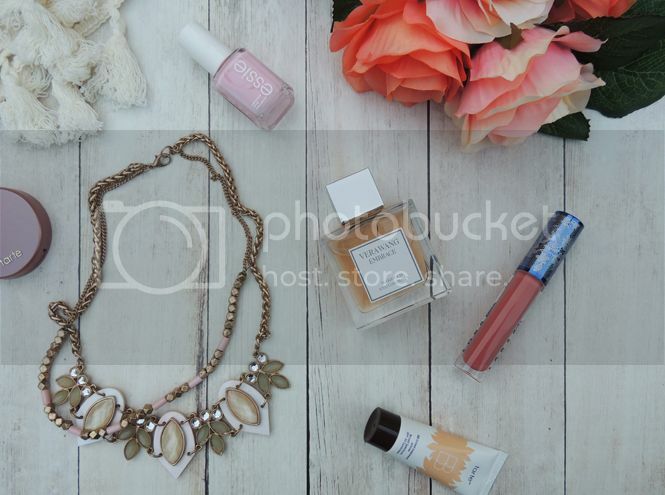 This cream colored tank is my favorite this summer, and when I wear it with my favorite makeup products and my Vera Wang Embrace fragrances, I feel absolutely beautiful! 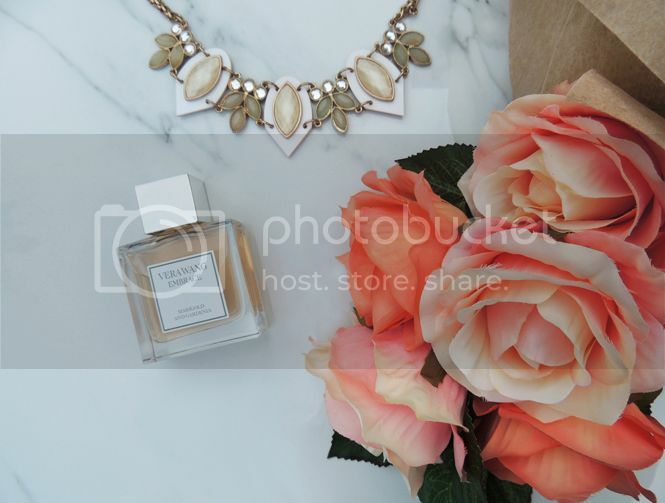 The Marigold and Gardenia is a fun floral scent and it's the most feminine, light and airy fragrance out there. 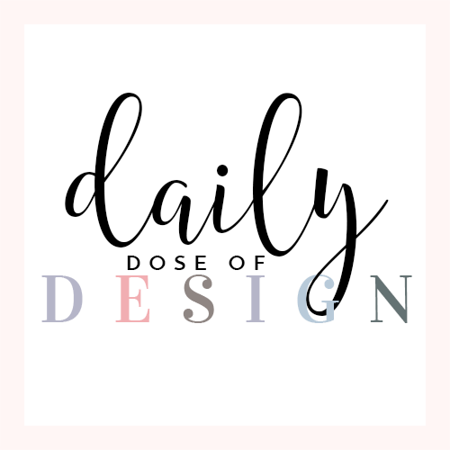 I love when perfume lasts a long time and when using a little bit goes a long way, which makes this fragrance the perfect every day option. When I first smelled the Vera Wang Embrace Collection scents, I instantly fell in love. The Marigold and Gardenia is my favorite (although they're all beautiful) because it's unlike any other perfume I own. I would describe it as a delicate mix of fresh florals and sweet melon. It lasts ALL day long too which is great for a long summer day of adventures and fun! There's so many fun things to do during the summer and in the heat, no one wants to worry about anything other than feeling as beautiful as possible. It's a truly amazing feeling when you can feel beautiful - summer is my favorite season and although beauty routines require more work and your skin needs some more TLC thanks to the sun, feeling your best isn't ever something you should skimp out on no matter how busy you are! 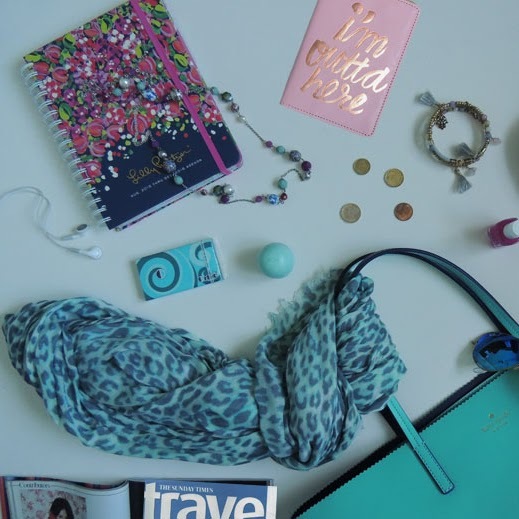 As I plan a couple of exciting and upcoming trips, I'm already thinking about how perfect this scent will be for the beach and tropics, too. And can we talk about how easy it'll be to travel with since the packaging is um, perfect?! The best part is, it's super easy to find/buy this fragrance and the other scents in the Embrace Collection. 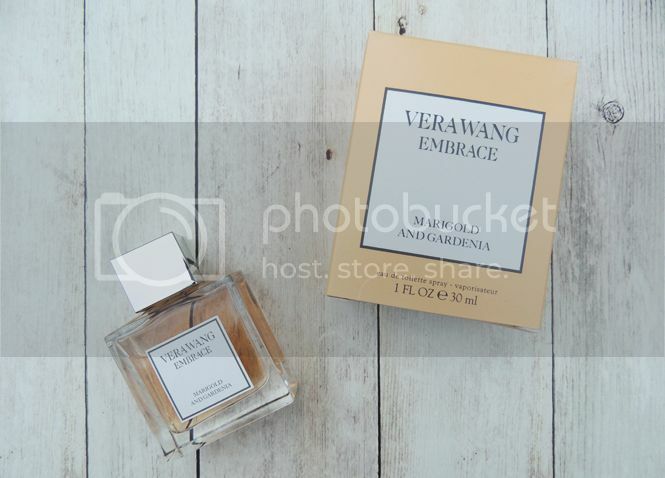 Vera Wang Embrace Marigold and Gardenia is available for purchase in-store and online at Kohl’s for only $29.99! 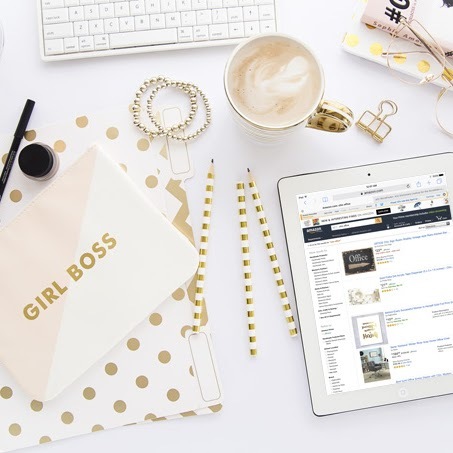 It makes for a really great gift for you, another girl boss in your life - or pick one up for both of you with how affordable it is! 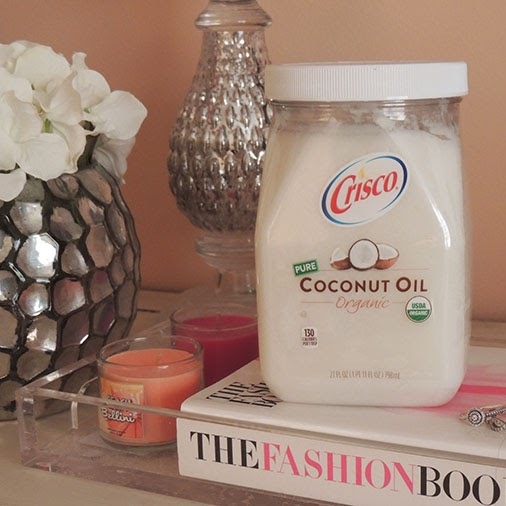 Every woman should have this scent in her life and I guarantee it'll become a summer beauty staple for you, too! Now I have some super exciting news... you guys all have a chance to with one of ten Vera Wang Embrace fragrance collection packs that include the Marigold and Gardenia scent along with the Green Tea and Pear Blossom, Rose and Vanilla and Periwinkle and Iris scents too! The giveaway is opened now through July 12, 2016 and you can simply enter below with one of your social media outlets; good luck! It's true, our makeup and nail polish colors do tend to differ from winter to summer, so it makes sense that our fragrance would too! 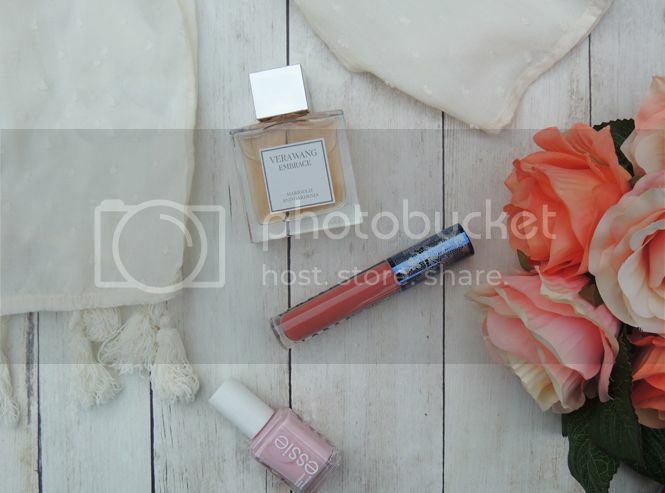 I love the pastel palette and the gardenia fragrance sounds like a cool one too! Sounds like another Vera Wang winner! I have not use perfume in years because usually it's too strong for me, but I always do like trying new ones and just seeing if they work for me. I did not know she made perfume I will have to check it out. The Vera Wang perfume seems perfect for summer time! I try to limit my makeup use in the summer time but I fresh fragrance is a must. Sounds like a lovely fragrance! This perfume sounds amazing! I've been looking for a perfect perfume so I'll have to check this out! That scent sounds awesome! Love that necklace too! That perfume looks like it smells heavenly! That Essie color is so pretty. I'll have to try it! So many of my favorite brands. 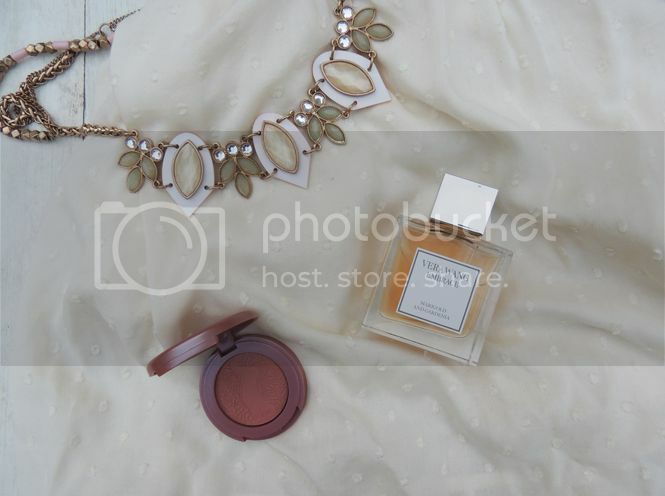 There is nothing like a Tarte Blush and some Lorac Lipgloss. And that necklace is amazing. I haven't tried any fragrances from Vera Wang, but will be sure to check them out next time I'm at Kohl's. Fiji is one of my favorite summer nail colors and Essie is the best! I don't think you'll ever find me without a BB cream on in the summer, it's so light and perfect for summer! Great post! Vera Wang has some great scents! I haven't had a chance to smell this one yet, but I bet it's wonderful. 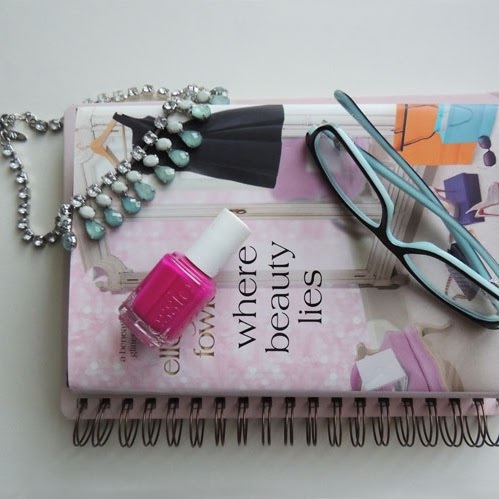 Loving that pink Essie polish as well! I've never tried the Ver Wang perfume before, but it sounds like it smells just lovely. Gardenia is my mom's favorite flower / smell. She used to have a gardenia bush planted outside her bedroom window and she would sleep with the window open so she could smell it all night. That scent always makes me think of her. Ah I need to try Verag Wang. Will probably request it for my next ScentBird subscription. And that Essie color? I love it and need it. Sounds like I need to try the new Vera Wang! Thanks for sharing! I agree that perfume can make you feel GREAT!! I love Vera Wang so I need to sample this one! I've never tried Vera Wang perfume before! I'm right there with ya with the BB cream. It's a lifesaver! That Vera Wang perfume sounds like the kind of scent that I like and it's definitely going to be perfect for the summer. I would love to give it a try! I'm obsessed with marigolds. They're so beautiful and fragrant. I'll have to check this out. I love that necklace so much!! It's amazing how much of a difference some perfume and a little lip gloss can make! The necklace is so nice, I love it! A nice perfume will give a big difference especially during summer. I'll have to check out this scent next time I'm in Kohls!! I like that necklace, looks so gorgeous. I want that perfume too, I can imagine how sweet the smell is. I really want to find a new scent-been suing my hubby's until I find my own new one :O ! I love the bottle and the price even more. I'll have to check it out. Gorgeous photos! Love the color of that Essie. In love with the necklace. I haven't yet tried Vera but now am convinced I need to!! These are awesome suggestions. I'm definitely a less is more type of girl during the summer just because it's so to out. The Vera Wang fragrance sounds amazing. Those are all some very nice products. I bet the Vera Wang perfume smells amazing. I don't know if I have ever smelled any of those products before. I love the bottle too. It's packaged nice. Looks good, bottle's very appealing and I'm sure it smells very nice. I'm glad it can be ordered online, I'll be sure to check other Vera Wang products as well. The fragrance sounds amazing and so perfect for summer! I agree on using a BB cream for summer, so much more lightweight and I love the added protection. Great nail polish color as well! i have used Vera Wang princess for years but have not branched out to try her other scents. I have this and it smells SO good! I'm usually not huge on floral scents, but fell in love with this one! Anything that motivates you or make you feel beautiful is a wise choice. I am sure this perfume smells really good. Such a great routine. Anything Vera Wang I am sure smells absolutely amazing too. I'm DYING to try this fragrance - the description of the scent sounds right up my alley!! I love going to Kohl's! They have such a great collection of Vera Wang things. I def need to check out her fragrances. This sounds like the perfume of my Summer Dreams!I hope I can try it. I love Essie nail polish, it's a must have for me. I want to try out that perfume. I love a nice perfume. This only sounds amazing! I will need to purchase it. In summers my skin becomes oily and sticky and in order to prevent this I generally avoid oily creams or oil based skin care products. Also, I prefer drinking lot of water to hydrate my skin properly.